UPDATED: Fri., March 30, 2018, 10:49 p.m.
Gregory Polanco hit a three-run homer in the 13th inning to lift the Pittsburgh Pirates to a 13-10 victory over the Detroit Tigers on Friday in Detroit – about an hour after the Tigers spilled onto the field to celebrate what they thought was a game-winning hit of their own. Nicholas Castellanos was initially called safe at home in the bottom of the 10th for the Tigers, but a replay review took the run away and the teams played on. 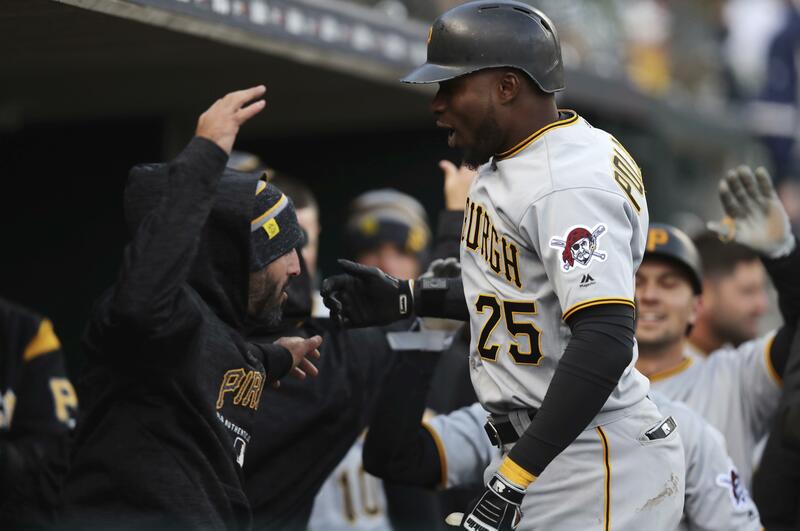 Polanco’s drive to right-center on a 3-0 pitch from Alex Wilson (0-1) finally gave the Pirates a comfortable lead – or as comfortable as could be on a wacky day in which both teams scored four runs in the ninth. By the time the 5-hour, 27-minute game was over, there were only three umpires and one manager left. Plate umpire Mike Everitt exited in the eighth with a concussion after being hit in the mask by a pitch. And Ron Gardenhire – in his first game as Tigers manager – was ejected after the overturned call in the 10th. Brewers 8, Padres 6: Ryan Braun hit a three-run homer with two outs in the ninth and Milwaukee rallied for five runs off All-Star closer Brad Hand to stun the Padres in San Diego. The Brewers trailed 6-3 coming into the ninth and quickly jumped on Hand (0-1) for two runs on three hits, a grounder and his throwing error. Angels 2, Athletics 1: Mike Trout homered and scored twice and Los Angeles defeated Oakland in Oakland, California. The Angels held on despite a rocky ninth inning by closer Blake Parker. Red Sox 1, Rays 0: David Price was solid in his return to the Red Sox rotation, allowing four singles over seven scoreless innings of Boston’s victory over Tampa Bay in St. Petersburg, Florida. The five-time All-Star, slowed by injury much of 2017, struck out five and walked none in his first start for the defending A.L. East champions since last July, when he went on the disabled list with left elbow inflammation. Nationals 2, Reds 0: Max Scherzer struck out 10 in six innings and visiting Washington, in its first game with Dave Martinez as a major league manager, beat Cincinnati to begin defense of its N.L. East title. A day after this opener at Great American Ball Park was postponed because of rain, Scherzer (1-0) picked up where he left off. The winner of the last two N.L. Cy Young Awards gave up five hits, walked one and permitted just one runner past first base. Diamondbacks 9, Rockies 8: Nick Ahmed had a career-best five RBIs and Arizona regrouped after blowing a five-run lead, topping Colorado in Phoenix. Ahmed hit a three-run homer in Arizona’s five-run first inning and an RBI single in the third. He added another run-scoring single off reliever Antonio Senzatela (0-1) in the fifth, giving the Diamondbacks an 8-7 lead after the Rockies had tied it with a five-run fourth against Robbie Ray. Ray (1-0) got the victory despite allowing seven runs, six earned, and seven hits in five innings. He struck out eight, walked three and threw two wild pitches. Yankees 4, Blue Jays 2: Masahiro Tanaka pitched six sharp innings and New York beat the Blue Jays in Toronto. Tommy Kahnle got four outs, David Robertson retired two batters and Aroldis Chapman pitched around Yangervis Solarte’s two-out RBI double to earn his first save. Rangers 5, Astros 1: Doug Fister mostly silenced the powerful Houston lineup for five innings in his Texas debut, Nomar Mazara homered for an early lead and Texas defeateed Houston in Arlington, Texas. The right-hander who pitched for the Astros in 2016, the year before they won their first World Series, allowed only Max Stassi’s RBI double in the fifth in his new home ballpark, where he had an 8.73 ERA coming in. Marlins 2, Cubs 1 (17): Miguel Rojas drove in Brian Anderson with a single to center in the 17th inning, and Miami topped visiting Chicago. It was the second game-ending RBI for Rojas, who did it once last year with a sacrifice fly. This one will go into Marlins lore, not only for its 5-hour, 18-minute length – but moreso because it’s the first win of Derek Jeter’s era as Miami’s CEO. Giants 1, Dodgers 0: Joe Panik homered for the second straight game, this time off closer Kenley Jansen, and San Francisco defeated the Dodgers in Los Angeles. The Giants won by an identical score in Thursday’s season opener on Panik’s solo shot off Clayton Kershaw. This time, Panik went deep to the right field pavilion leading off the ninth against Jansen, making Giants skipper Bruce Bochy the first visiting manager to amass 100 wins at Dodger Stadium. San Francisco’s Johnny Cueto retired the first 18 batters he faced before Chris Taylor singled to lead off the seventh. Phillies 5, Braves 4 (11): Carlos Santana drove in J.P. Crawford with a sacrifice fly in the 11th inning, and first-year Philadelphia manager Gabe Kapler went through nine pitchers for his first win as Philadelphia won in Atlanta. Kapler, who was criticized for pulling Aaron Nola with a 5-0 lead after Nola threw only 68 pitches in the Braves’ 8-5 win on Thursday night, used eight relievers after Nick Pivetta lasted only four innings. Published: March 30, 2018, 10:21 p.m. Updated: March 30, 2018, 10:49 p.m.